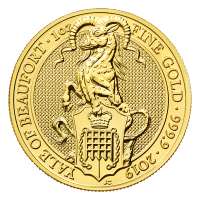 Bestias de la Reina | Moneda de Oro Yale de Beaufort 2019 de 1 onza | Casa de la Moneda Real Acquire your 1 oz 2019 Royal Mint Queen's Beasts | Yale of Beaufort gold coin online at the lowest price guaranteed! The Yale of Beaufort joins a unique cast of heraldic animals which were present at the coronation of her Majesty Queen Elizabeth II. The Yale of Beaufort is captured with stunning accuracy in the elegant rendition portrayed on the reverse side. The beast stands before an impressive textured background as a crowned portcullis, representative of King Henry VII, rests below. The reverse side also features the beasts title, year of issue, and its 9999 purity in fine Gold. The obverse of this coin features Jody Clark’s right facing bust of Queen Elizabeth II while keeping the textured element consistent as its background. Celebrate British history and expand your portfolio with this impressive and imaginative coin from us today!